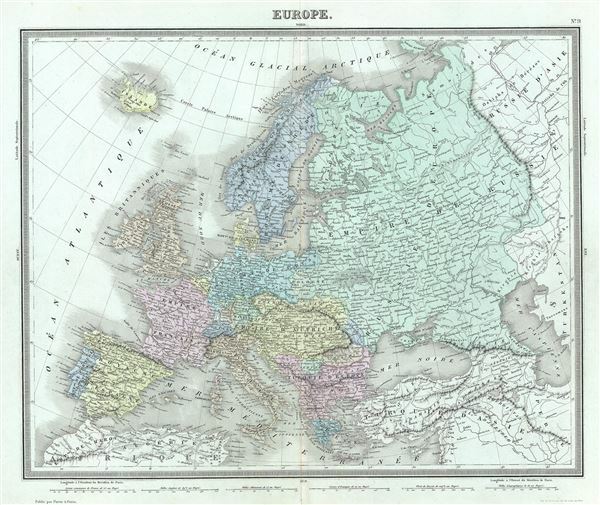 This is an example of Ambroise Tardieu's 1874 map of Europe. It covers the continent in its entirety from the Atlantic to the Caspian Sea and from the Arctic Ocean to the Mediterranean Sea. It also details Iceland and parts of Turkey in Asia. Shows Italy as one unified nation. Throughout, the map identifies various railroads, cities, towns, rivers, islands, mountain passes and an assortment of additional topographical details. The map is color coded according to regional and political boundaries with elevation rendered by hachure. This map was prepared by Ambroise Tardieu and issued as plate 9 in his 1874 edition of Atlas Universel de Geographie Ancienne et Moderne.